Inverness Caledonian Thistle has announced a club record profit of more than £250,000. It is the third successive annual profit and a significant increase on last year's £28,000. The Highlanders won the Scottish Cup for the first time last season and finished third in the Premiership. "It shows what's possible when everyone shares a dream. Our intention is to continue to build on what has been achieved," said chairman Kenny Cameron. 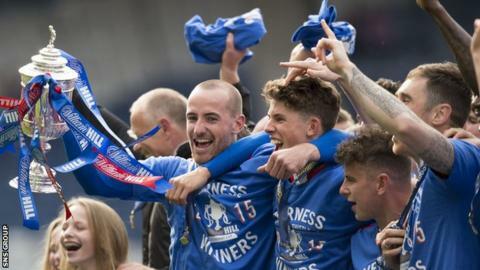 "Our strategy and business model has again served us well over a memorable period in which we won the Scottish Cup, finished third in the Premiership and qualified for the Europa League. "The lack of a league sponsor impacted on club income while player and staff rewards for achievement increased our spend but the Scottish Cup revenue and the sale of Billy Mckay to Wigan in January ensured a more than acceptable return. "We've been aware for some time that we have a very special group of players. We've done our best to retain the services of the majority of them to ensure squad stability going forward." Last season's captain Graeme Shinnie left for Aberdeen in the summer under freedom of contract and Cameron revealed that the club had rejected "numerous offers" for the player. The accounts show that turnover rose to £4,623,203 from £3,891,475 the year before. Since then, season ticket sales have increased while Scotland U21 midfielder Ryan Christie has been sold to Celtic.